How end-to-end temperature monitoring improves produce quality, reduces waste, and increases customer satisfaction and profitability. Download a complimentary copy of this report here. There is a war going on among grocery retailers—the ‘Freshness War.’ Grocers are acutely aware that the quality and selection of their produce, meat, and dairy sections is the prime determinant of where consumers decide to shop for their groceries, as shown in studies from FMI and others. And these are the highest margin departments as well. 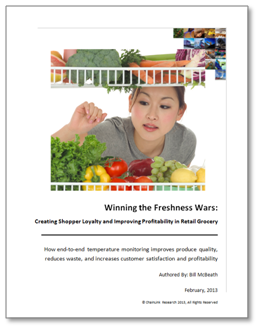 Freshness—the Foundation of Competitiveness in Grocery—The changing competitive landscape in grocery, evolving consumer habits and lifestyles, and growing awareness of food safety. Challenges in Becoming the Best in Freshness—Challenges introduced by the increasing length and complexity of the fresh foods supply chain and the distributed nature of freshness responsibility; statistics on how big the problem is and how much it costs the grocer. Solutions—How an end-to-end approach, monitoring temperature from the field to the retailer’s door, can help reduce spoilage and provide consistent freshness. Getting Started—Steps for retailers towards achieving a self-funding freshness improvement initiative.